Iraklia of the “Lesser” Cyclades (called the Lesser Cyclades due to limited ferry service and very small populations), offers an alternative to mass tourism, plush resorts, and throbbing nightlife. However, these islands are being discovered of late, so you can expect to find some crowds (given their small size!) during the high summer months of July and August. You will find on each of these little gems simplicity, sunshine, great beaches, and pretty walks. Just pack a couple of bathing suits, one pair of comfy walking shoes, a pile of books, and plenty of sun block, and come visit the “Lesser” Cyclades. On this page we profile Iraklia. If we have piqued your interest to “discover” more about the other three islands, please check under their individual titles, Schinoussa, Donoussa, and Koufonissia. 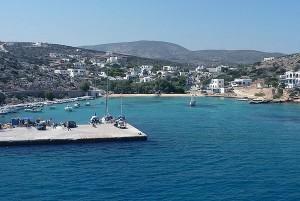 Of the four islands, Iraklia is growing the fastest with regard to tourist infrastructure. This is interesting, as it was the least populated and most primitive, with only about 120 inhabitants. Most of the tourist services are centered around its small harbor, Ai. Georgios, and the main town of Chora is inland, about 3.5 kilometers from the port. The island is a delight for walkers, as its entire size is only 19 square kilometers (7.33 sq. miles)! Since the island is a bit short on public transport (! ), you will walk just about everywhere. The island has some ruins of an old castle, a walk of about 15 minutes from the port, plus a cave in the southwest, accessible from the main town (and with a guide!). Peace, quiet, and pristine beauty await visitors to this tiny, sweet island paradise.